Photographers occasionally shoot images of people reflected in windows, framed by windows, or looking through windows. Such images can be visually distinctive while also prompting more reflexive viewing: one sees both the image and some aspect of seeing. The two images below are examples of this visual thinking, while also reflecting other conventions that mediate global communication. 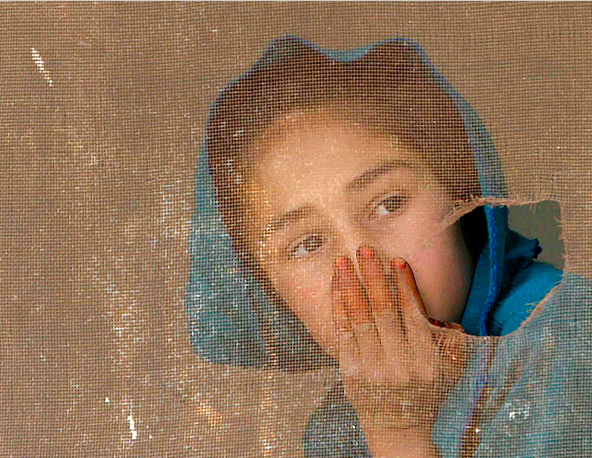 This photograph shows an Afghan schoolgirl. The good news is that she is in school–not a given in Afghanistan. The bad news is that the photographer has put her under the veil. The window screen stands in for the chadiri she is likely to wear as a woman, while the rip in the screen might be a trace of orientalist fantasy, one shaded further by the stain on her hand. The implication is that, despite being in school, she still needs to be liberated. She would welcome that, it seems, as she is looking not through the screen but through the tear. That gash in the screen could stand for poverty or accident, but it makes the screen appear the more inevitable. Although a close-up shot of a vibrant young girl, she remains on the other side of a barrier. That barrier dulls perception in both directions. She seems a lost soul, ghost-like, someone who can see and be seen but not someone we can touch or help, as she really is from another world. There are others in that world. 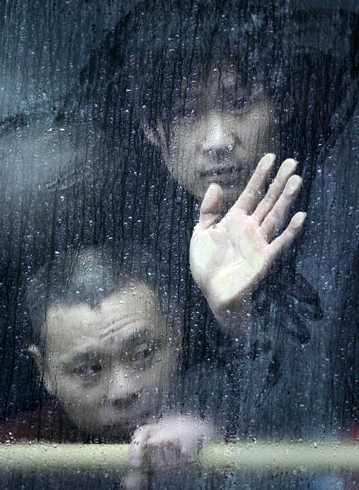 This is actually only a temporary confinement, as they are passengers in a Chinese train delayed by heavy snow. But that news is the least of it. Surely this is a vision of the human condition of separation, of the transparent barrier that stands between any human being and another. One grips the rail and looks to the side, warily; he has learned to expect the worst. The younger man still can admit to his yearning to connect. He looks at us, reaches out and puts his hand to the glass, as if we might place ours against his, as if we could touch and not feel only the cold glass. Each photo tells us that it is not enough to see; we also need to connect. The Biblical allusion in the title of this post is to the beautiful poem in 1 Corinthians 13. Now we see in a “glass” (in the oft-quoted King James translation, referring to a mirror) darkly, but when united with God we shall see face to face. This vision of heaven doubles as a vision of how humanity might live with itself. Indeed, it might be that one step to achieving heaven on earth is to see one another as if face to face. To do that, we have to not settle for merely being able to see through barriers that still dull empathy and divide one from another. Photographs by Rafig Maqbool and Vincent Yu for the Associated Press.